Traveling or vacationing is something everyone says they wish they could do more, but don’t. Why? Maybe they “don’t have time” or “don’t have the money.” I don’t have kids, but I do understand travel IS more complicated when you have kiddos. But you know what, it IS possible. I’m not here to give you a pep talk on WHY you should be making traveling a priority in your life, or how to do it easily with children (because yeahhhh, I’m not much help on that one). You’re here because you’re already planning to take a trip sometime in the next year (or two), maybe you’re wanting a destination wedding or you’re planning your honeymoon, and you want to get the best deal and save as much money as you can. So, let’s get to it! I directed this blog post at newly engaged couples considering the possibility of a destination wedding (like the one I photographed in Aruba) or those planning an affordable honeymoon, because I’m a destination wedding photographer who loves to travel, but these tips could apply to anyone! 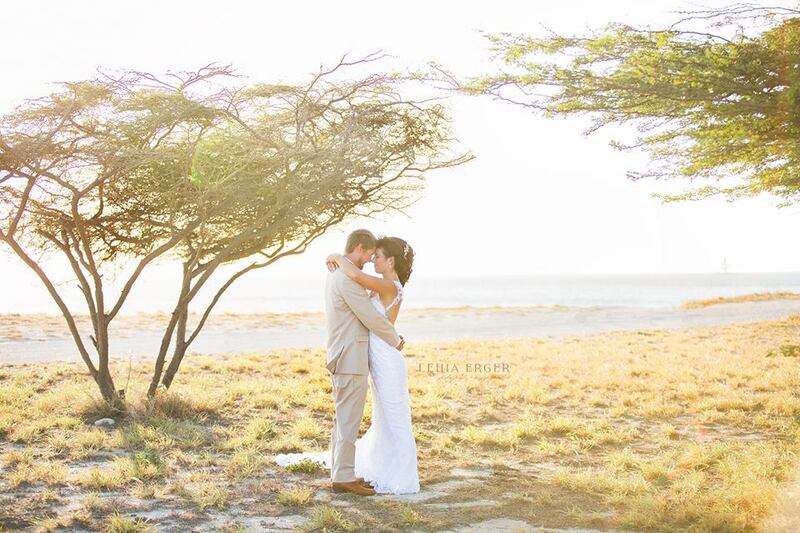 This wedding in Aruba was so relaxing! What an amazing way to spend your wedding day and week. Reading that headline makes me think “ick!” It seems like I’m about to go all sales-y on you, doesn’t it. Trust me, I’m not here to try to SELL you on getting these credit cards. (p.s. I’m not affiliated at all, but they do have a referral program which I have linked below.) I just love sharing smart ways to save money! These are a no-brainer to me now. ESPECIALLY if you’re planning a wedding, because of how expensive they are — you might as well be getting some of that money back! Everyone starts a wedding savings account for their wedding expenses, which is smart! My next step would be to get a credit card that makes sense for your lifestyle and use it to pay for your wedding expenses — as well as everything else you buy in your everyday life. Then throughout the week, you go into your credit card account and you will select your wedding savings account to pay for the wedding items you purchase. (I go into mine about every other day to pay it off, and so I can easily track my expenses.) So, yes, I understand that this is an extra step, but I feel like it’s WAY worth it for the amount you’ll save on your travel expenses in the end. When I first started looking into these, my heads was SPINNING! I tell everyone I know about them now because I love them! Disclaimer: Credit cards can be risky if you have a hard time saving money and don’t track your spending. If you treat them like a regular bank account, don’t spend more than you have and pay them off throughout the week (I do this online and it takes 2 seconds), this should be a breeze for you. To recap, when you start using the Chase Freedom Unlimited to make your everyday purchases, you earn free money back on what you’d be spending anyway, and the Chase Sapphire Preferred is a great add-on credit card for those who dine out or travel already, to get MORE points for those things. More points = more free money towards traveling (aka your destination wedding or honeymoon)! Like I said, it’s a no-brainer. Photos from our yearly trip to Acapulco. Like I mentioned above, we’ve already earned $1600 this year that we plan to use towards our future plane tickets. While $1600 in free money is AMAZING, we’re not going to blow it by not doing our research on the BEST flight options. Whenever I’m planning a trip, I always start with Google Flights. In my experience, they show me the ALL of the options and best deals and the site is straight forward and easy to navigate. You can use Google Flights to see your flight costs for certain dates as well as what flying on different dates might cost you. If you can change your flight from leaving on a Saturday to leaving on a Thursday for example, you might be able to save a few hundred dollars. Something else I do frequently is compare costs from flying out from other cities near me, or even into cities near my destination if I’m already planning on renting a car anyway. I’m based out of Center Point, Iowa and there is an airport nearby in Cedar Rapids. This is ideal because you don’t have to pay for parking if you have a friend or family member drop you off and pick you up. But by checking out the larger airports within a 4-hour driving distance (Des Moines, Quad Cities, Minneapolis or Chicago for example) I could save A LOT of money and make the drive worth it. But it has to be a price difference that makes sense when you factor in the cost of parking your car, gas expense and if it’s worth the extra time it takes. I have only ever flown out of the Eastern Iowa Airport in Cedar Rapids or the O’Hare International Airport in Chicago. And I 100% would pay a little extra money to fly Delta because we always have the best experiences with them. (So much so that I almost got THEIR credit card but didn’t want to be hindered on only flying where they offer flights or ONLY with them. Unfortunately I sometimes can’t choose Delta if their prices are way higher than the other options.) While flying out of your nearest airport is easier, sometimes flying out from the nearest large-city airport still makes more sense on your budget. When we fly from O’Hare in Chicago, we choose to either Park ‘N’ Fly/Park, Sleep, Fly or use a parking/shuttle service, depending on what time our flight is. If we have an early flight and don’t want to wake up at 2 am to make the commute to Chicago, or our returning flight will and late and we don’t want to make the 4-hour trek back super tired, we have used the Park ‘N’ Fly (or Park, Sleep, Fly) option. This is where a hotel will let you park your vehicle in their parking lot while you’re on your trip for a smaller fee if you stay at least one night with them. More often than not, we will choose to use a parking/shuttle service. We found Blue Sky Parking when we first started traveling and they only charged $8/night for parking. Their prices have gone up a bit since then but their customer service is worth it. You pay to park your car in their lot while you are gone and they drop you off and pick you up at the airport when you need them. They even have scraped our windows from snow and pre-heated our car for our return during the cold winter months! We were so thankful! For the sake of this example, I’ll use our most common trip we take. We vacation in Acapulco, Mexico each year for 2 weeks around January. As I’m looking at Google Flights right now, ideally we would like to leave on a Friday and return on a Saturday so we can have all of Sunday to recover from traveling before heading back to work on Monday. So let’s put our tentative date at Jan 10th — Jan 25th to avoid any of the American holidays. Our of Cedar Rapids, our best option is a 9.5 hour flight for $573. Ok, so let’s see if I can find a better deal. As I was choosing my dates, I noticed that Google Flights was showing me that flying out on a Thursday was a slightly better deal, but still not worth it. My next variable would be trying different airports. Flying out of Chicago those same dates would be $524 for a 9.5 hour flight. We’d also have to add in our driving time. This is not worth it either. I even checked different dates for flying out of Chicago and there wasn’t a significant price drop. If Chicago flights would’ve been a at least $200 cheaper than Cedar Rapids, I would’ve considered it. Parking in the Blue Sky parking ramp for 14 days would cost us around $168, and my boyfriend and I would split the cost. So if Chicago’s flights would’ve been around $373 or less, we might go that route. That’s a savings of $116 per ticket ($573 - ($373 + $84)). But gas would have cost us maybe $100 a person for the trip there and back (I like to round to the heavier side of costs so I know I’m being safe) and it would be 8 hours of driving. So there goes that $116 ticket costs savings. No thanks to that option! So you will have to play around with the different variables, do the math and see what makes sense with your situation and needs. If I’m planning a trip, I check the flights every other day for a while. I use my notepad on my computer or phone and track the weekday (Monday, Tuesday, Wednesday, etc) and what the flight costs as well as how long it is for comparison consistency. If you start planning for an affordable honeymoon at the same time as you begin wedding planning, this should give you enough time. By tracking for several months, you will start to see trends on your flights. Costs might drop at the end of the month or on certain weekdays. Then you will know that if you’ve been seeing a price drop on the last Wednesday of every month, for example, then you know to wait until then to purchase your tickets. It does take some effort to remember to consistently check and track flights, but I enjoy it. I do also have the Hopper app on my phone that sends me a notification if prices drop on the flights on watching, which might be a good option for you to try, but I have noticed that it doesn’t include ALL the flights I’m watching when I look at Google Flights, unfortunately. For example, I used it before booking our flights for our Glacier trip and it told me the cheapest flight was $500 but on Google Flights, there are SO many that were cheaper. Photos from Canada, Aruba and Acapulo. One things that surprises me the most is how under-rated renting an Airbnb is compared to staying at a hotel or all-inclusive resorts. While I get that there are major perks to hotels/resorts, if you’re trying to travel more and pay less, Airbnb rental should be your first choice! There are many reasons I love Airbnbs. They’re cheaper usually, depending on which one you choose. You can find amazing ones within your budget and cheaper than a hotel. You can have your own private home to stay in with all the amenities. You can have your own private pool/hot tub. Parking can be free and you just have to pull right in the drive way. And my favorite reason is because you can get your own kitchen. You don’t have to eat out 100% of the time you’re hungry. You can stock up on groceries, snacks and drink mixes and save so much money this way! If you’ve never heard of Airbnb, it’s where people will let you rent out their vacation or rental homes to stay in while they are not living there. Sometimes they might be neighbors who bought the property next door, or they might live in the top portion of the house while renting out the bottom. You can rent entire houses to just a single room. You can filter your search on their site to match exactly what you’re looking for, but make sure to read the descriptions and reviews before making a final decision. Sometimes if content is unclear, I will even contact the Airbnb listing’s owner and ask them. My favorite Airbnb so far was our trip to Aruba. We stayed HERE. It was beautiful! I currently have a LONG list of places from all over the world that in my “Dream Travel” list in my Airbnb account, like Vietnam, Ireland, Spain and even Disney! Photos from our Airbnb in Aruba. These do not do it justice! Two last things before I end this VERY long blog is 1. set up your bank account to transfer money weekly or biweekly and 2. join traveling groups on Facebook. You can set up your bank account to automatically transfer money to a savings account for you. I have done this for years, and I’d recommend starting it ASAP, even if you’re aren’t in the midst of planning a trip. You can do this online usually, or you might have to call your bank, but transferring whatever you can afford, whether it’s $10 a week or $40+ a week, you will have saved up $500-$2000 without really even noticing it. Not you can put that towards your affordable honeymoon or destination wedding! $500 can easily be a plane ticket or almost a full week at an Airbnb! By joining traveling groups on Facebook, you can easily use it as a resource from real people. I love the Girls Love Travel group and find all the best sight-seeing and restaurant recommendations there. You can use the search bar for groups to search what has already been discussed. So just type in wherever you’re traveling and read the unbiased opinions of other travelers! Before we left for Aruba, I searched the Girls Love Travel group for ideas and suggestions and my two favorite experiences from our trip came from there. (UTV rental to tour the island/Natural Pool and Zeerovers). Photos from our UTV rental and Zeerovers in Aruba. That’s all the travel budgeting tips I have for you today. Anything that I missed that I should be doing?! I’d love to hear your recommendations. I hope you have a wonderful (and affordable) honeymoon or destination wedding. (And keep me in mind if you’re needing a destination wedding photographer who would LOVE to travel with you!) Happy traveling! Want more information about bringing me with you!? Fill out this form and I’ll be in touch!